London: E Newbery. G : in Good condition without dust jacket.Cover rubbed with c. 1cm loss to spine ends. Hinges weak but holding. Ink inscription to fep. 1800. Eighth Edition. Brown leather cover. 170mm x 110mm (7" x 4"). 271pp. Black and white engravings by John Bewick throughout. 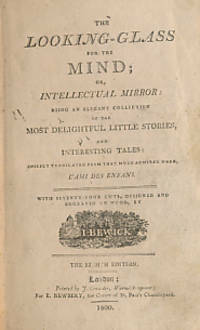 A sequence of short stories originally called The Beauties which are fables or morality tales. .